When I heard Kigali was getting Mexican food I started counting down the minutes until I could hold a sweet burrito in my hands once again. The day finally came when Meze Fresh Burrito Bar opened. From first bite, it didn’t disappoint. Kigali’s premire Cali-Mex establishment is doing it right. Although newly opened, Meze Fresh attracts a crowd. The high-turnover means food isn’t sitting out very long and what you get is indeed fresh. You may have to wait in line if you go during the lunch or dinner rush but it moves fairly quickly and certainly beats the wait at any sit-down restaurant in Kigali. The friendly staff is still learning but have been trained well. One of the most impressive facets of Meze Fresh is the customer service and energy of the staff. Seriously, that crew makes work look so fun! They seem to have a good system going, even when it gets hectic. While waiting in line, you can check out what’s up in the kitchen through big windows. How refreshing! I’ve eaten a lot of questionable meals in Kigali and seeing food during the cooking process is comforting. The restaurant on the whole is kept very clean. There’s plenty of seating but if you go with a big group it’s advisable to save a table first. You may find bygone cafeteria woes relatable – if you are taking your own food to your table, it’s just better to have a place to go. There are bar stools but avoid them if you (or your dress) are at all short. And once the place is buzzing, it’s loud. I prefer the upstairs seating because it’s a bit more relaxed and comes with a lovely view on the side. Whether you’re sitting upstairs or down, the cheerful mood is contagious; call it your midday pick-me-up if you chose to go for lunch. Meze Fresh offers burritos, burrito bowls (burrito sans tortilla), tacos (2), and soon to come salads. 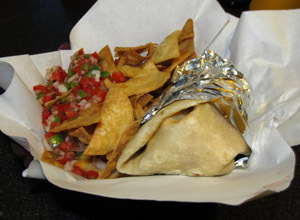 Burritos seem to be the most popular item – and to be honest, the only thing I’ve tried so far. Choose any form of your meal; price is dependent on the protein. Rwf 4,000 for pork or chicken, Rwf 3,800 for steak, and Rwf 2,800 if you opt for vegetarian. The prices may be a bit steep for some, but the burritos are hefty and worth their weight in francs. I’ve managed to try them all. The marinade on the chicken makes it the clear winner in my book. The burrito starts with scoops of rice, beans, and meat. Then come all the fun add-ins. One of my favorites is their out-of-this-world purple cabbage slaw. It adds the perfect crunch and is a more than apt substitute for lettuce… not sure why they don’t do lettuce but I’m sure there’s a good reason. The salsa is just right for my onion and tomato fix and the guacamole is best right inside the burrito as well. For me, just a little cheese and hot sauce seals the deal. I’m not big on spice but I hear they are packing heat. I always wanted to say that. What I mean is they have hot sauces named Fire and Death… you’re on your own with those. A couple add-ins will hike the burrito price, like Rwf 400 for sour cream or mango salsa. GET THE MANGO SALSA. That’s all I have to say about that. A side of flour tortilla chips cost Rwf 500 and make a great addition to the meal. Drink prices are average at Rwf 600 for a water or soft drink and local beers cost Rwf 1,000 each. Meze Fresh boasts a few drinks hard to find elsewhere in Kigali like ginger beer, Leffe, and Corona, just to name a few. Unfortunately, I’m still waiting to satiate my thirst for Coronas because every time I go they are out of stock. In the meantime, the margaritas have been holding me over. If tequila doesn’t do it for you (or does too much for you) stop by between 3-7 and 9-11 to check out the happy hours specials. 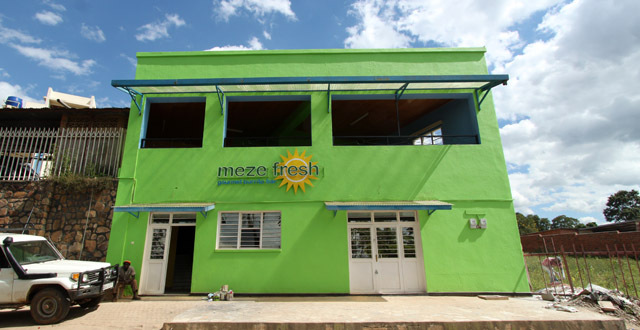 Meze Fresh is very centrally located between Kimihurura and Kacyiru. It’s on the shortcut after the New Times building that comes out at Shokola Lite. The building is bright green and impossible to miss. Good food, but know the “system” – – I didn’t know that you are supposed to shout out if you want a bowl BEFORE the tortilla emerges from the kitchen – – I got chastised “Soup Nazi”-style (reference to eponymous Seinfeld episode) by the server because I mentioned this seemingly key fact only after the tortilla was in his hand. 🙂 Sigh. Thank god for Meze Fresh! As a New Mexican living without burritos has been one of the greatest sufferings I’ve had to endure in my nearly three years in Kigali. Their selection is a bit narrow, but what they have is truly delicious. The atmosphere is quite nice and the service is really friendly. The prices are a little on the high side, but to get good food in Kigali you have to expect to spend a little. I also love the fact that they have several brands of beer you just can’t find anywhere else. Overall, it’s just a good place with great food. Good addition to Kigali , but GOD the place is dirty and not up to what you should be expecting considering the price of the food. Not mentioning that the colors are not really flattering for the food. Food is good, atmosphere is very bad…. I wouldn’t say the place is dirty but I do agree that the atmosphere isn’t the greatest. I guess it’s meant to be more of a takeaway place? I wish it was a bit more cozy feeling but I’m not going to let that keep me from yummy Mexican food. What a great “fast food” option in town! Loved the selection of fresh salsas. I really like the food Meze Fresh, and eat there all the time, but it seems to be suffering from the inattention of its proprietor of late. The bathroom is gross, and the employees seem to never have been taught how to properly clean it. I cannot regularly eat at a restaurant that appears unsanitary. If it was cheaper and not owned by an expat I might understand. At these prices, why no towels or hand-dryer in the bathroom? We tried this today for a late lunch. Enjoyed the food–but the salad bowl was more like a big wonton and had hardly any lettuce. Next time I migh just get a bowl with the fixings I like and a side of chips and salsa. And I am new to Rwanda-but I found the bathrooms much above the standard I’ve seen in many other parts of Africa-though not the fanciest I’ve seen here, they were clean and stocked with paper. Great! But where are your star ratings?